: Board Collector: WAX ON- Friday night opening! 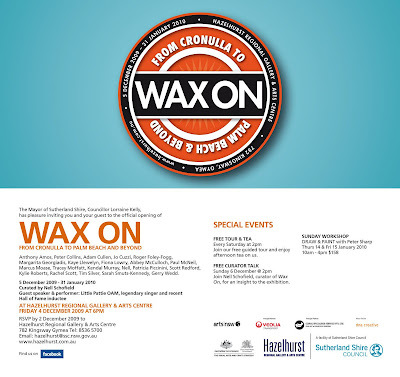 Hazelhurst Regional Gallery & Arts Centre is proud to present Wax On: From Cronulla to Palm Beach and Beyond, an exhibition that showcases artworks about surfing and its significance within contemporary Australian visual culture. In her curatorial debut, arts broadcaster, avid surfer and Puberty Blues star, Nell Schofield has selected artworks for Wax On that are informed by how the vernacular visual languages of surfing have an ongoing impact on contemporary visual arts and culture.